With few exceptions, Pueblo remains a one-party town, but like most one-party states, there are powerful factional differences that often explode into political fratricide. In the 2012 primary election, the Pueblo Democratic Party dispatched the long-serving local politician and first-term District Attorney, Bill Thiebaut, replacing him with a county commissioner. But Thiebaut himself had just come to power four years earlier by beating the long-term District Attorney Gus Sandstrom in a primary. championed the one issue that could defeat her in Pueblo – guns. Pueblo, especially men, hunt and own guns. Her opposition is not some out-of-town moneyed lobbyists, but local, well-organized, online savvy political activists. Their newness to the process gives them credibility and they have passion. Their excellent positioning and natural talent is reflected in gathering 13,000 signatures with volunteers and having 12,000 verified by using new online technology. On September 10, watch Pueblo for an upset of the Democratic Party establishment. The National Journal positions Hickenlooper with Andrew Cuomo in New York and Martin O’Malley in Maryland as leading their states down a more socially liberal path. Cuomo and O’Malley are rivals to Hillary Clinton (albeit weak), but Hickenlooper is also on the long list of potential presidential or, in Tina Brown’s view, vice presidential candidates. Hickenlooper’s special challenge is that Colorado, especially in a lower turnout governor’s election year of 2014, is a less certain Democratic state than New York or Maryland. Possibly more important, Hickenlooper has benefited by being seen as not particularly partisan and mostly moderate – an image that took a beating from January to May this year. The National Journal story (picked up in local conservative website, Colorado Peak Politics) hit the main facts. Colorado, a perennial presidential battleground, is experiencing a fierce backlash over the state’s adoption of liberal policies. The state is facing its first recall elections for a pair of Democratic lawmakers who backed stricter gun-control laws spurred by the Newtown murders and the slayings of 12 people in an Aurora movie theater one year ago. In northern Colorado, several rural counties are threatening to secede over the new gun restrictions, driving privileges for illegal immigrants, and a renewable-energy mandate. While Hickenlooper has public opinion on his side on most of these social issues, taken together, they could fuel Republican attacks that the Democratic Party has become too radical and push away moderate voters. Amid declining approval ratings, Hickenlooper has also endorsed a controversial $1 billion tax hike for public schools. The latest Quinnipiac poll shows that 67 percent of voters disagree with his decision to postpone the execution of Nathan Dunlap, convicted of killing four people in a Chuck E. Cheese’s restaurant in 1993. “Democrats have been talking a lot about Republicans being [pushed] into the extremes, and some Democrats here are anxious about a parallel situation,” Ciruli said. Indeed, for old timers, I was the Democratic State Party Chair in 1983-85 (Gary Hart ran for 1984 nomination and Walter Mondale, the nominee, won one state), but I’ve been an independent since 1985, and for nearly 30 years have tried to offer balanced, fair and evidence-based analyses of Colorado politics. The record shows I’m equally complimentary or critical as warranted of Democratic and Republican politics and politicians over those three decades. Of course, the title, “former Democratic chairman,” provides extra punch when my observations are critical of Hickenlooper and Democrats – that is the Peak’s agenda. However, my purpose is to capture what I believe is the developing political frame for the 2014 election. Tuesday was an especially bad day for President Obama. New polls tested the bottom of his approval range with 41 percent and 48 percent disapproval from a McClatchy-Marist poll, helping push him further into negative territory in the RealClearPolitics.com polling average. The immigration bill, the last hope for salvaging anything out of his first term agenda, is in trouble, partially because rank and file Republican voters; i.e., primary voters, who are resistant to reform in general, reject reform 9-to-1 when his name is associated with it. He has a net negative impact on his own agenda. Washington gridlock has joined a stream of foreign news in which America and Obama appear as bystanders sideling his foreign policy initiatives and his aggressive second term agenda highlighted at the inaugural. And, in what has been widely panned as a desperate effort to change the subject and gain some traction, the Obama team “pivots” for the umpteenth time to the economy. Good idea, you can’t go wrong with the economy, but it looks defensive and it’s hardly clear what he can do about the fact that 50 percent of the public believe next year will be about the same as this one for their personal finances. Ironically, he announced the latest pivot at a briefing with his highly talented November campaign organization, which morphed into a national lobbying effort for his now stalled agenda. As they say in Washington – bad optics. A rumor is moving around Denver City Hall that District Attorney Mitch Morrissey is being encouraged to run for mayor. It is unconfirmed. Some Denver police, in particular, have expressed unhappiness with department changes, and the Mayor is dealing with angry local park advocates. Those two departments are large with powerful constituencies. Mayor Hancock is also struggling to contain the rivalries of regional neighbors in Adams and Arapahoe counties. The next election is May 2015, a long ways off. Incumbent mayors tend to be re-elected, even those with very controversial first terms, like Federico Pena and Wellington Webb. But some constituents may be sending a message. CU President Bruce Benson is Colorado’s most interesting politician. In two recent interviews, he has candidly assessed his election chances and ambitions post the painful 1994 campaign against Roy Romer and his readiness to do another five years as president of CU at 75 years old. Benson not only makes his own case, but the case for the entire Silent Generation (born from 1927 to 1945 during the Great Depression and WWII) who want to continue working, some of whom are in senior positions of corporations, government and other institutions. But, he’s also expressing the anxieties and the interests of the Baby Boom Generation, just now passing 65, who want to stay in the workforce. Benson has always been a straight talker; it’s just a pleasure to hear someone speak up in the era of calibrated comments. If John Hickenlooper, for whatever reason, should decline to run, the Republican Party should nominate Benson by acclamation. Immigration reform is stalling in the House of Representatives due to the particular dynamics of the Republican House caucus and the changing national political environment. First, the environment. The President is rapidly slipping into the second-term malaise, and a major cause is the near complete lack of accomplishment after his sky-high inaugural address and showy launch of a permanent campaign dedicated to his agenda. Unfortunately, immigration reform, which combines legislation that addresses what the public believes is needed with the self-interest of both parties and Congress as an institution, is the victim of the President’s decline. Republicans who have concluded it is important to get immigration reform behind them are beginning to lose colleagues and constituents pleased by the growing sense that Obama could take the party down to major defeat in 2014 and anxious to not give him any legislative victory. Equally important is the fact the House Republicans’ caucus has at least 60 members who believe immigration reform related to a path to citizenship is bad policy and bad politics regardless of the viewpoint of party leadership or presidential campaign strategists. Critics would say they are a mix of one-third extremists and two-thirds of those fearing a primary. Passing immigration reform would be a benefit to Republicans nationally and the institution of the House. They finally get something done. In March 2003, 80 percent of Americans supported the war in Iraq. Today, only 38 percent believe it was worth fighting, and although the general interest in foreign policy and the war has declined, passionate minorities still fight the war on social media and in their attitudes reported to pollsters. A recent ABC News/Washington Post poll shows 19 percent of Americans strongly believe the war was worth it, but 43 percent, or more than two-to-one, strongly disagree. Of course, Republicans remain more supportive. Fifty seven percent believe the war was worth it, but only 27 percent of Democrats do. Iraq became a liability for President Bush by late 2004 as it became clear the end was not near and the cost in lives and money was growing. Within a few months of Bush’s re-election, support for the war and his reputation began to sink in a nearly one-to-one relationship with support for the war. It highlighted the estrangement between the Republican Washington establishment and the grassroots. Of course, the current viewpoint on the war’s worth is being influenced by five years of Obama’s administration’s criticism of it and the November 2011 complete withdrawal. Republicans and independent voters’ views of the war have turned decisively negative in the last two years. The race for governor in Colorado has finally picked up a bit of momentum. Senator Greg Brophy of Wray announced, and although he’s an unlikely threat to John Hickenlooper’s re-election today, he does signal that new blood is looking at the race. Early candidates are coming up with good lines. Brophy said he’s pro-life for the unborn and Hickenlooper is pro-life for mass murderers. George Brauchler, Arapahoe DA, said Hickenlooper was elected the state’s governor not the state’s bartender. Brauchler is interesting because he engages Hickenlooper on a serious weakness, crime and he has a base in the metro area’s top swing county. However, Hickenlooper remains enthusiastic for the job and has a knack for accumulating friends in the metro power structure. Also working in the governor’s favor is a disorganized Republican Party, the economy in slow recovery and the perception that governors get re-elected (1974 was the last defeat of an incumbent (John Vanderhoof) and he had not been elected on his own, but was the lieutenant governor replacing Gov. John Love, who went to a cabinet position in the Nixon administration). Hickenlooper has to be somewhat worried that President Obama’s sagging approval could be a weight on the party and turnout will be back to the off-year the 1.7 million, down from 2.4 million presidential level. Hickenlooper only won by 51 percent in 2010 against weak opponents, although in a hellacious year for Democrats. More specifically, Hickenlooper is dealing with his own convoluted death penalty decision and his failure to issue a single veto against the Republican-described out-of-control Denver/Boulder dominated left wing legislature. Democrats’ total control of the legislature was assumed to be a burden for Hickenlooper in 2012 post-election commentary. It was, and unfortunately for the Democrats, the problem lives on in two recalls of senior legislators and a revolt among rural public officials. In addition, the Governor has committed to the party, the K-12 public education establishment and the progressive business community that he will actively campaign for a record-level income tax increase for education, reinforcing an image of the tax favoring governor of the liberal state of Colorado. See 9NEWS: Can Gov. Hickenlooper win re-election? 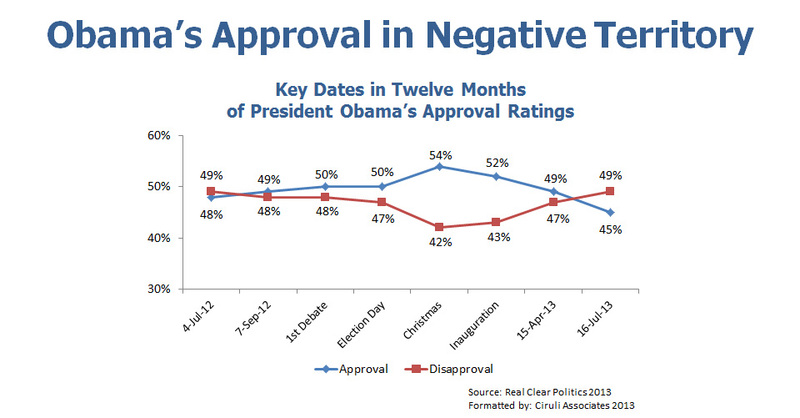 Does Obama’s Low Approval Hurt the 2014 House and Senate Races? Signals are mixed if next year could be good for House and Senate Democrats. The latest generic ballot test has Democrats in the lead by 4 points. Democrats have run superior campaigns in recent years and have much refined their ability to blame Republicans for Washington’s gridlock. 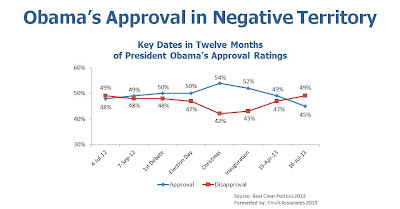 But the question is: At what point does President Obama’s negative approval rating begin to hurt the entire Democratic ticket? As pointed out on June 25 in a response blog post to Democratic pollster Mark Mellman, “Mellman is wrong, Obama is losing clout,” Obama’s polls are headed down due to the run of controversies, lack of accomplishments and the wave of foreign policy challenges. Mellman argued that most of Obama’s approval ratings at that time were at about 50 percent, and due to polarization, there was a floor he could fall below. Today, Obama is hanging on to 45 percent, but some new polls are lower. His negative performance rating is now at 49 percent, but a week ago, it was 51 percent. He is now a net 4 points to the downside. Although these numbers are well above George W. Bush’s weak approval in 2006 when the House went Democratic for the first time since the 1994 Gingrich revolution, Obama’s numbers are similar to his approval (3 to 5 points negative) in the September to November 2010 period when Republicans recaptured the House. There is, of course, still time for Obama to recover before November 2014, but if it gets much worse, watch Democrats have trouble in recruitment and fundraising, and some candidates, including incumbents in competitive state re-elections, begin to shy away from Obama. To get $950 million from Coloradans from the income tax requires a massive tax increase. For income above $75,000 per year, income taxes go up 27 percent, or according to proponents, $595 for the average taxpayer. For lower income residents the income tax increase is 8 percent, averaging an additional $166 per year. SHALL STATE TAXES BE INCREASED BY $950,100,000 ANNUALLY IN THE FIRST FULL FISCAL YEAR AND BY SUCH AMOUNTS AS ARE RAISED THEREAFTER BY AMENDMENTS TO THE COLORADO CONSTITUTION AND THE COLORADO REVISED STATUTES CONCERNING FUNDING FOR PRESCHOOL THROUGH TWELFTH-GRADE PUBLIC EDUCATION, AND, IN CONNECTION THEREWITH, INCREASING THE CURRENT STATE INCOME TAX RATE ON INDIVIDUALS, ESTATES, AND TRUSTS AND IMPOSING AN ADDITIONAL RATE SO HIGHER AMOUNTS OF INCOME ARE TAXED AT HIGHER RATES…. The Buzz: One billion for schools: Reform or bailout? In yesterday’s blog post on the U.S. Senate, Ken Buck, who announced on July 2, was left out. Given his name identification with Republican rank and file and winning a tough primary in 2010, he qualifies as the frontrunner. Will his campaign team and his core supporters line up for another run? It’s too early to tell, but like Bob Beauprez, a high-profile loss when many believed you were going to win is difficult to overcome. The largest nation in the Middle East is in the middle of a continuing violent revolution that began in the winter of 2011 and exploded during the last month with street demonstrations, a military coup and counter-demonstrations. Although Egypt is an Islamic nation and shares many Islamic characteristics, it has also been closer to the West than many Middle East nations. The public professes strong adherence to tenets of Islam, but the nation has secular-oriented business and military establishments and many secular attitudes in its massive youth population. Americans considered Egypt an ally before the revolution began, but now only 40 percent consider it favorably. 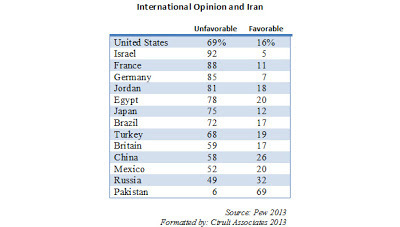 Egyptians, likewise, are hostile to Americans. They are mostly hostile to an exaggerated view of our influence on their choice of government and its operation. There are many contradictions in Egyptian society. The military has just shut down a couple of Muslim Brotherhood media outlets and the nation is not seen by Freedom House as not having a free media. But, 74 percent of Egyptians believe their media is free. Much of the revolution has been driven by the Internet, especially cell phones, but the nation is at the primitive end of the range of home Internet access (13%). The 2014 U.S. Senate race is beginning to generate some competition. Mark Udall, incumbent, who still is much favored to win, can now speculate on an opponent. Although none of the early competition looked formidable, he must have some concern about the continued poor reputation of Congress and the collapse of President Obama’s approval rating (Obama is 6 points negative). A recent poll showed Udall with less than 50 percent approval (45%) and a quarter (24%) of the public unable to rate him. After five years, he’s not making much of an impression. Republicans, after a slow start, have three legislators either announcing their intent to run or seriously investigating the race. Senator Randy Baumgardner. Western Slope senator, conservative, colorful, but no access to money or a population base. Senator Owen Hill. New state senator, bright, good resume from Colorado Springs. Representative Amy Stephens, former House Majority Leader, strong campaigner from Colorado Springs. Along with these new faces, former Congressman Bob Beauprez continues to mull the race. He served as the party’s chief spokesman during the presidential campaign, but still carries the baggage of the weak governor’s race in 2006. As a member of the Republican establishment, he doesn’t have much support with passionate right. But, he is the best-known of the group and could raise some initial money. Colorado voters are beginning a discussion on how to improve public education and to decide if they should add one billion dollars to teachers, programs, capital projects and technology. A new Denver regional poll highlights voters’ beliefs that “choice among public schools, charter schools and private schools” will be effective to lower dropout rates, get more children into college and improve the entire public school system. Three-quarters of regional voters supported encouraging providing charter schools and open enrollment. The public is ahead of most of the politicians, including advocates, for school choice, who continue to defer action while anti-reform groups fight to delay or derail choice. The question will be: Is the reform offered in the initiative sufficient to justify one billion more in taxes into a somewhat improved current system? The survey was sponsored by ACE Scholarships, which provides private funding for low-income students to attend private schools of their choice. Independent, parochial and charter schools are rated higher than public schools by Denver metro voters. A recent metro voter survey incorporated a question developed by the Gallup poll asking residents how they rate K-12 schools on a scale of excellent, good, only fair or poor. Both metro residents and the public nationwide rate independent private, parochial or church-related, and charter schools higher than public schools. 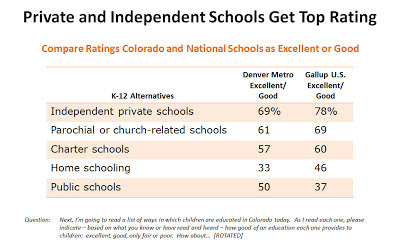 Denver metro residents rate the area’s public schools substantially higher than the ratings public schools receive nationally (50% to 37%). Just at the moment Colorado voters are debating how to reform public education and fund the effort with a one billion dollar tax increase, it is clear the public prefers alternatives to traditional public schools. 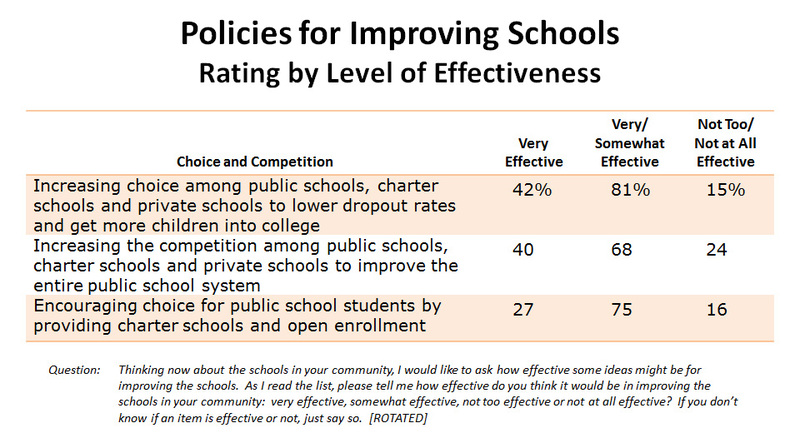 What is not clear is if the new initiative sufficiently addresses the public’s strong preference for school choice. The campaign to add $1 billion dollars to K-12 education funding in Colorado started its petition drive to acquire 86,160 valid signatures by August 4. Proponents believe it will be a game changer for education. They will get their signatures. The education establishment is the state’s largest government industry. They will spend record amounts to pass the tax. But statewide taxes are difficult to pass and this will be a low turnout election. There is anger at the Denver legislature’s alleged overreach and ignoring non-metro areas. Strong backing from the Colorado education and business community may mean a better chance of success for Initiative 22 in a statewide election than has been the history in the past few years, according to Ciruli. The historical track record for statewide tax increases doesn’t bode well for the campaign, he said this week. ‘The presumption is against them… very few have had any luck raising taxes statewide.’ People are much more willing to support local school boards, bonds and mill levy overrides than statewide tax increases, Ciruli explained. He pointed to the effort in 2011 by Sen. Rollie Heath, D-Boulder, to ask voters to approve a measure similar to Initiative 22. The 2011 measure, Proposition 103, sought to increase income tax rates from 4.63 percent to 5 percent, but it also included a temporary increase in sales taxes. More than one million votes were cast on the issue, but voters resoundingly rejected it, 64 to 36 percent. Another hurdle to be overcome for Initiative 22 supporters may be the ‘mini-revolt’ going on in state politics. Ciruli said that the current attitude toward what came from the General Assembly during the last session may set the theme for what the election season looks like. People are angry and may have a ‘hostile attitude toward taxes,’ he said. That anger is most visible in the recall efforts and the secession movement in northern Colorado, he added. Indeed, the initiative will be a game changer, but less in terms of educational outcomes, which frankly only change slowly, if at all, in the public system. More importantly for the political landscape, if it wins, it will signal the new progressive era in Colorado that began in 2004 is secure and moving forward. But if it loses, it will be a major setback for Democrats and tax spending advocates. Transportation, higher education and a myriad of “needs” are waiting in line for voter approval. Governor Chris Christie and Senator Marco Rubio, who are on the list of leading Republican presidential nominees, run even with Hillary Clinton in early Colorado face-offs. Christie beats Clinton 44 percent to 41 percent and Rubio leads 46 percent to 45 percent for Clinton. The poll also tested Vice President Biden, and he lost to both by double digits, a sign that Colorado may be swinging back Republican after two Democratic wins by Barack Obama. Without a high-profile, even if somewhat polarizing candidate like Clinton, Colorado Democrats appear in trouble in this early test. The Quinnipiac poll cited above was from June 14, 2013. Gallup released a poll the same day and confirmed the early frontrunners for the Republican nomination are four national legislators; Paul Ryan, Marco Rubio, Rand Paul, Ted Cruz and Governor Christie. Initiative 22, the $950 million income tax increase, will be on the November ballot, assuming the advocates can gather 86,105 valid signatures, a modest undertaking given the powerful forces supporting the bill. But, as recounted in a blog on June 11, the initiative faces a difficult political environment. And, the biggest challenge is the diminished turnout in odd-year elections. It was just two years ago when less than a million votes crushed Proposition 103, State Senator Rollie Heath’s half a billion dollars temporary tax for K-12 education. The 2011 voters were in an anti-tax mood, to some extent left over from the 2010 Tea Party-dominated election. Heath was largely on his own. This year, the full weight of the Democratic Party and the state’s education establishment are behind this initiative. They are hoping to attract the business and general civic communities due to the initiative’s accompaniment by a significant education reform measure. However, Colorado voters are hardly easy targets for state tax increases, and this income tax hike is major. It remains to see what the general mood is toward the initiative, but there is a mini revolt brewing among some voters upset with the Democrat’s aggressive legislative agenda. Although President-elect Hassan Rouhani, deemed a moderate, may reflect little more than a public relations shift given the structured choices Iranian citizens have in their presidential field and the final authority of the Supreme Leader, Ayatollah Ali Khamenei, the country is greatly in need of a leader who can overhaul its image. The image is a product of not only the intransigence of the religious and other leadership to engage in serious nuclear negotiations, but to the country’s association with terrorist activities and the near comedic diplomatic strategy of former President Ahmadinejad with his confrontational speeches and overtures to leaders, like Hugo Chavez. The belligerent and ineffectual foreign policy is responsible for an economy strangled with sanctions. Even the limited campaigning allowed, which included two debates, highlighted the general dissatisfaction with the state of affairs. Improving relations with the world, ending sanctions, controlling inflation and getting the economy moving were repeated by most of the candidates. The election result appears to confirm a substantial body of opinion in favor of a lighter touch. If Rouhani represents a real change, can he get some room to operate?